Ever since uTorrent was first released back in 2005, Mac and Linux users have been begging the developers to code a version compatible with their computers. In 2006, when uTorrent was sold to BitTorrent Inc., the company promised that a Mac version was coming, and in 2008 it was finally released. Fast forward another two years and a Linux version was announced. Voted as one of the top suggestions for uTorrent in the client’s ‘Idea Bank‘, the massive demand from users for a Linux client was impossible to ignore. In June of this year BitTorrent Inc. officially stated that it was working on Linux programs, and today the first one was released. BitTorrent’s VP of Product Management Simon Morris realizes that the company pretty much owed this release to the community that played such a vital role in popularizing the protocol. “If any group has embraced the possibilities and power of BitTorrent for distribution, it is the Linux community. Virtually every distribution is available via torrent download and many even ship with a BitTorrent client in the default configuration,” he says today. Labeled as an Alpha release, uTorrent Linux Server precedes a client with a full featured UI which is expected to be released in the coming weeks. Today’s release is aimed at more Linux users, who are encouraged to leave feedback so the development team can prepare releases for specific Linux distros in the future. 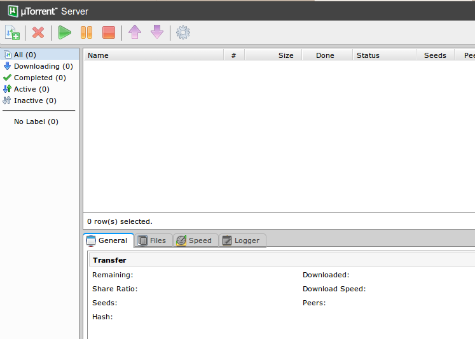 The server can be managed through an HTTP API or the uTorrent Web UI pictured below, which is included in the release. “Today’s version is only the first step, and we will continue to support the Linux user community with new versions in the near future. If you prefer to stick to more conventional user experience, rest assured we are working hard to build a full-featured client, coming soon,” Morris announced. There is currently no update on whether the company will make the “summer” deadline they set earlier. With uTorrent Server, BitTorrent Inc’s main brand is now supported on Windows, Mac and Linux platforms in common with its main competitor, Vuze. Whether it will reach the massive marketshare it has on Windows with the two latter platforms has still to be seen though. Considering the late entrance, uTorrent has a lot of ground to make up.